The way consumers pay one another is changing as payments migrate from cash and checks to digital transactions. Boston, April 11, 2018 – The last decade has seen tremendous growth in the availability of digital person-to-person payment methods, and tech giants are posing a huge threat to traditional payments providers by entering the payments space with fast, easy, and convenient digital payment methods for consumers. U.S. consumers are actively exploring the use of these new mobile payment services available through traditional financial institutions as well as those from alternative providers. 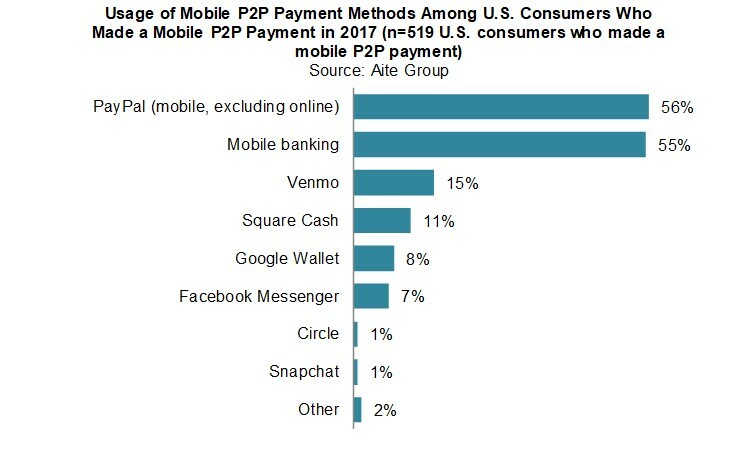 This report, part one of a two-part series examining the domestic and cross-border P2P payments landscape in the U.S., estimates the total size of the P2P payments market, evaluates the difference in U.S. consumer payment behaviors between 2014 and 2017, and provides a detailed analysis of the U.S. domestic P2P payments environment. In Q4 2017, Aite Group conducted a quantitative study of 1,974 U.S. consumers 18 years of age and older who paid someone, gave money to someone, or transferred money to another individual from October 2016 to September 2017. This 35-page Impact Report contains 24 figures and eight tables. Clients of Aite Group’s Retail Banking & Payments service can download this report, the corresponding charts, and the Executive Impact Deck. This report mentions Amazon, Apple, Circle, Google, Facebook, MoneyGram, PayPal, Popmoney, Snapchat, Square, Venmo, Western Union, Xoom, and Zelle.